One of the things I love best about book clubs is that the book selections are often not what I would have picked to read myself. Case in point, The Hunger Games, by Suzanne Collins, which is the current book selection for Cook the Books, the online foodie book club. This month, our host Heather, the Girlichef, chose this title for our reading pleasure and our viewing pleasure, as Cook the Books teamed up with Food n' Flix, a blog event that features foodie films. The result is that I got to read a book that I normally would have passed by as being "one of those books for young adults" and which I really enjoyed. The set up is that the United States has undergone some kind of nuclear/global warming catastrophe in the future and there is a new country, Panem (Latin for bread), which consists of a decadently wealthy Capitol with twelve outlying districts, for which the virtually enslaved residents provide resources. The heroine of the Hunger Games is Katniss Everdeen, a resident of the coal-mining District #12, who lives with her shell-shocked mother and younger sister, Primrose. Every year the Capitol requires that the districts produce human "tributes" to a a gladiator-like event, the eponymous Hunger Games, in which entrants fight a bloody battle to the death. When Primrose is selected in a lottery to represent District 12 at the Hunger Games, Katniss volunteers to serve in her stead. She is joined by a local boy, Peeta, son of a baker (so of course I kept thinking of pita bread whenever I read his name) and I won't spoil the rest of the book for you all by revealing further details. I will just say that I thoroughly enjoyed this book and all the allusions to ancient Rome. I even gobbled up the rest of the trilogy, Catching Fire and Mockingjay, though I think the first book was the best written and had the most captivating plot. I wanted to also join in the fun with Food n' Flix, so I rented the Hunger Games movie and really enjoyed that as well, though I do think the book was much more entertaining. I don't think the movie captured as many details as imaginatively as I envisioned them (the costume changes, the descriptions of Katniss' internal moods, the songs of the Mockingjays were all not as vivid for me), though I though actress Jennifer Lawrence made a splendid Katniss. (If you would like to see her in another strong role, check out Winter's Bone some time). And now, for the "cooking up some Hunger Games-inspired grub" portion of this post. Much of the book (and film) features the cotnrast between what the haves and have-nots eat. The Capitol residents gorge (and purge) themselves on rich, gourmet foods, while the poorer District residents are perpetually hungry and supplement their meager rations with black market purchases and barters or else forage and hunt for themselves. Katniss is a master hunter with her bow and arrow and she also has a great working knowledge of how to use wild plants for food and medicine, care of her parents. I was taken with a passage in the book where Katniss is wandering through the forest, hungry as usual, and she pulls off a bit of pine bark and chews on the pith underneath. I thought about foraging around my neighbors' fields to scrounge up some eats, but then I thought about pine nuts. 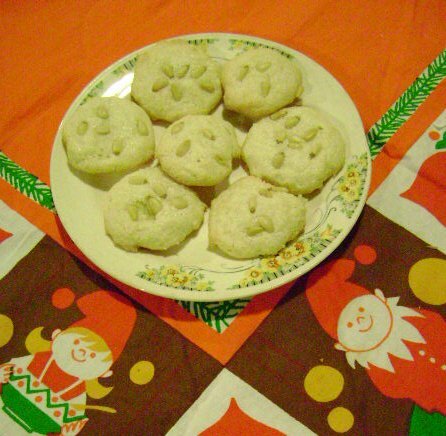 That led me to investigations of pine nut recipes and voila, I saw a wonderful recipe for pignoli cookies at Simply Gluten-Free. The recipe was very easy and I've made two batches since. I just found that I need to rotate the cookie sheets in the oven halfway through the baking time to prevent the lower trays from browning too much on the bottoms. They are chewy, satisfying, and (with a pinch of pine-y smelling ground rosemary mixed in the batter), a really nice herbal, chewy cookie. So here's to Katniss and all the strong women out there that nurture and protect their families. I toast you with a glass of milk and a couple of pignoli cookies! Please stop by and check out the roundup of all the other Hunger Games blog posts over at Cook the Books. Our lovely guest judge, Wendy, the Bookcooker, will be reviewing the posts and picking a winner after today's deadline. And please don't hesitate to join Cook the Books over the course of the next couple of months, as we read and cook from Andrea Camilleri's first Inspector Montalbano mystery, The Shape of Water. Submissions for that round of Cook the Books, (which I am hosting and which will have a surprise guest judge or two!) are due Monday, March 23, 2013. Those look like really delicious cookies! I do love pine nuts. I could use a few of those tasty cookies right about now. But, you're just too far away. Sigh, I'll have to bake them myself. I haven't read Hunger Games yet myself. Oh, and the cookies look fabulous. I *heart* pine nuts (but they're so expensive). I can always use a cookie...anytime. I don't know what acts up more, my sweet tooth or my martini tooth. Thanks for sharing the info about rotating the cookie sheets. I get the over browning sometimes when baking cookies. I will try that. What great inspiration. These cookies look soooo good. I thought the same about the book initially but loved it ultimately. I really like the way you came to the decision of making these cookies. From pine bark to pignoli cookies. So inspiring. Lovely cookies, too. Pine nuts have a great taste! Bad me--I am just now getting around to look at everyone's entries! ;-( It has been an insane couple of months. I love this cookies and the pairing of pine nuts and rosemary--a great combination of ingredients and representation of The Hunger Games.